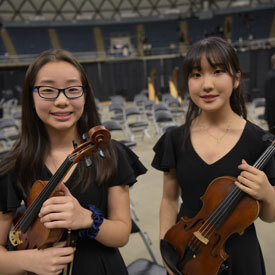 From middle school beginners to advanced high school orchestra players, including two all-state violinists, hundreds of Killeen ISD musicians combined Tuesday to make a joyful noise in celebration of a joyous holiday season. 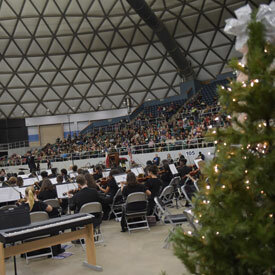 Putting a festive twist on its usual springtime string fling, the school district Fine Arts Department unwrapped “A Holiday String Extravaganza” that filled the Bell County Expo Center. Orchestras from Eastern Hills, Liberty Hill and Union Grove middle schools joined the Harker Heights High School orchestra and the Harker Heights High School Band string ensemble in the grand holiday spectacle. 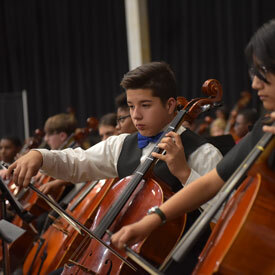 Killeen ISD Fine Arts Director Karen Herrera took the opportunity to highlight some of the orchestra’s accomplishments, including the program’s steady growth and impressive honors. About 500 fifth- through 12th-graders participate in orchestra. Many of those students gathered for about five hours prior to the concert to work together with directors from all four schools. The event began and ended with all participants playing together, the “Star-Spangled Banner” to start and “Faith Noel” to conclude. Lighted Christmas trees provided backdrop and testified to the special time of year. The concert program is scheduled to air during the holidays on KISD-TV. At intervals during the event, master of ceremonies Max Rudolph pointed out various group and individual accomplishments of the current school year. One of the largest of this year’s accomplishments, he said, is KISD’s first-ever All-State Orchestra members. Harker Heights High School senior Jeesoo Min and freshman Grace Koh earned the all-state distinction as violinists. With proud family members looking on, Rudolph directed high school orchestra honorees to stand. A total of 19 earned a spot in the All-Region orchestra, 12 auditioned for the all-state orchestra and two received that highest of designations. The concert started with beginners in their first year of orchestra. Next, intermediate players performed. They are second- and third-year players. Those who auditioned for the middle school All-Region orchestra received recognition. The high school orchestra played next, following the conclusion with the combined ensemble. High school orchestra is divided into four groups that perform throughout the school year in more than 20 events. Last month, upon finding out they made the All-State orchestra, Min and Koh expressed excitement. They are set to perform in a statewide ensemble in February in San Antonio. Min, a senior, splits her school days between Harker Heights High School and the Texas Bioscience Institute. She is president of National Honor Society and is positioned near the top of her graduating class. Koh was the top violinist in the middle school region three straight years before earning the All-State Orchestra status her first year of high school.